No. 240. 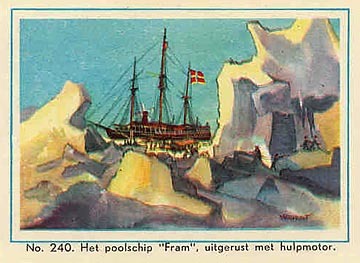 Het poolschip "Fram", uitgerust met hulpmotor. 109. FRAM. Issued by ? (Norway). (Date?). Card number 240 from a set of unknown number. Size: Ca. 4" x 2"?. Recto: The Fram in an icy scene. At the bottom: No. 240. Het poolschip "Fram", uitgerust met hulpmotor. Note: Image courtesy of Aubrey Halpern, UK.